Goat cheese, honey and pear is the ultimate autumn combination. We have a delicious vegetarian salad recipe for you with soft goat cheese, pear, honey, figs and red onion. You might be wondering if goat cheese during your pregnancy is a good idea, but yes you can eat goat cheese! Just make sure it´s made with pasteurized milk. Cheese is a bit fatty so you shouldn’t eat too much of it. Healthy? Yes it is as there are also a lot of health benefits to cheese, especially goat cheese! * It is a source of dairy. Good for the bones! * Goat cheese is easier to digest than ordinary cheese. Fine alternative to nausea or bloating! 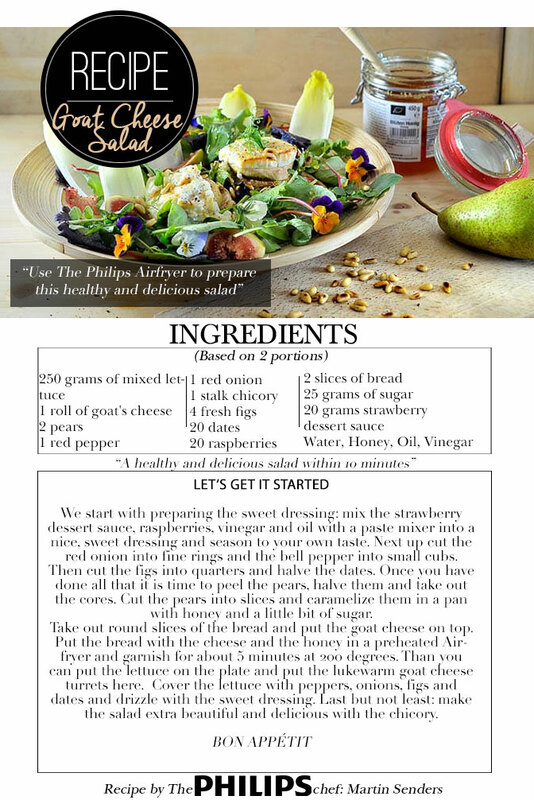 This goat cheese salad with pear recipe from the Philips chef is easily made at home with the Philips Airfryer.